I’ve been on a bit of a fitness app kick lately. I ditched the expensive gym membership a while ago in favor of working out at home, which meant I started picking up all kinds of apps to help me track my calories. I’ve stocked up on running apps, cardio apps, calorie-counting tools, calorie burning estimators…but I’ve been stymied when it comes to finding a good iPhone app for slower paced workouts. 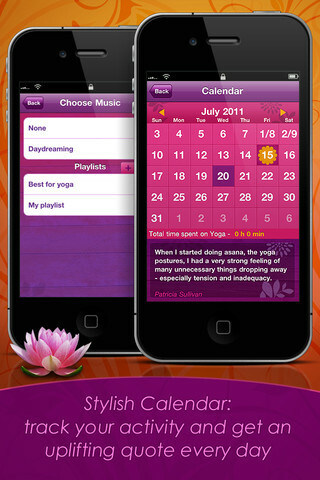 Enter the subject of this iPhone app review:YOGA Free: 250 Poses & Yoga Classes, developed by the Arawella Corporation. Hands down, it’s the best yoga app I’ve played with. I honestly can’t believe it was free. You can sign in with Facebook if you want to socialize your fitness experience, or skip ahead to the content itself. And boy, is there content a-plenty. There are images of 250 different yoga poses, along with detailed written info about how to perform each one correctly. There is a built-in sun salutation program for beginners, while more advanced students of the form can construct their own tailor-made program. Simply tap to add a pose, and you’re on your way. One of my favorite parts of YOGA Free is the Calendar feature. You can use this feature to track your workout durations, as well as which types of poses you did. There’s also an inspiring quote at the bottom of the calendar which changes daily. Can’t get enough of YOGA Free? 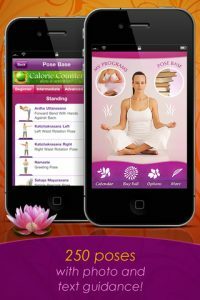 You can upgrade to the Full version, which has 300 poses, breathing exercise tutorials, 40 pre-planned yoga plans, and live app support, for only 99 cents. Whether you opt for YOGA Free or its paid cousin, you’re bound to love this beautifully designed, thoughtfully organized fitness app for iPhone. Visit yoga.com for more yoga apps. 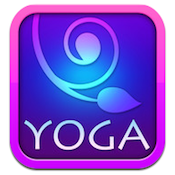 YOGA Free: 250 Poses & Yoga Classesis compatible with iPhone, iPod touch, and iPad. Requires iOS 3.0 or later.